In the remote and rural West Showa district of Ethiopia, not all parents have equal understanding of the importance in sending their children to school, and how this helps them become productive adults and succeed in life. Some may not even think about helping their children in their education, as most lack the awareness on how significant a quality education can be for shaping their children’s futures. 12-year-old Gelane lives in a community where Save the Children sponsorship funded programs started in 2011. Initially, there had been no school in her village, and parents had been sending their children far away to get to school, or kept them at home altogether. In order to reach the closest school, children would need to travel an average of 3 hours a day on foot. Often, only the stronger, older children would be able to make the journey, however many older children are also pulled out of school to help support their families. Additionally, the teachers that were available were untrained and used traditional, rote memorization teaching methods that do not create a supportive learning environment for children. All this combined to keep attendance rates very low and, for what children did attend, learning was difficult and not interactive or fun. Thanks to support from our sponsors, Save the Children was able to build a brand new school, train the teachers, provide learning materials and speak to parents about the importance of sending their children to school. Since then, all the children in the community have been going to school. Currently, the nearly 200 children from preschool to grade 4 who are now attending the new school would have found it nearly impossible to reach a school before. Through sponsorship across West Showa, new classrooms have been built in almost 50 different schools, supporting more than 30,000 children in accessing a quality education. 12-year-old Gelane is happy and proud to finally be back in school. Gelane, though she went to the old school, had struggled in completing grades or attending consistently due to the distance and lack of engaging lessons once she got there. She dropped out in grade 3, already falling behind other students at just 9 years old. Her parents needed her support to handle extra chores around the home, while her older siblings were allowed to continue learning instead. Gelane was out of school and at home for an almost unbearably long two years. Despite construction of the new school, dialogue amongst community members was still needed to sensitize parents and caregivers about the importance of an education. As a result of these efforts, sponsorship staff finally convinced Gelane’s parents that she should return to school. With Gelane’s dream of returning to school realized, she has been able to continue her learning in the same grade from when she had been forced to drop out. Today, she is enjoying school with both old and new friends, and participating in sponsorship’s literacy, numeracy and school health and nutrition programs at school. She found the school environment she returned to was full of new storybooks and lively and fun lessons for her to participate in. For example, through the newly established Girls’ Club, she is gaining important knowledge about how to keep her body safe and healthy as she becomes a woman – something she couldn’t get a word on from either of her parents at home as the topic is considered taboo. Additionally, at the newly established community learning center in her village, also set-up thanks to sponsors, she is able to practice her reading skills outside of school or on the weekends by using or borrowing the reading materials now available there. Gelane studying with some classmates from her sponsorship supported school. 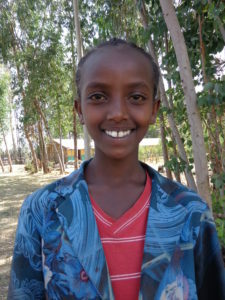 Today, Gelane dreams of completing all the grades in school, like her peers. She hopes that the support she is getting both in school and at the community learning center will help make this dream a reality. 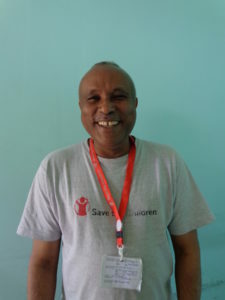 Little by little, things are changing in Ethiopia, and the children and families there have sponsors to thank for that. Thank you for your support to brighten the future for children in West Showa!